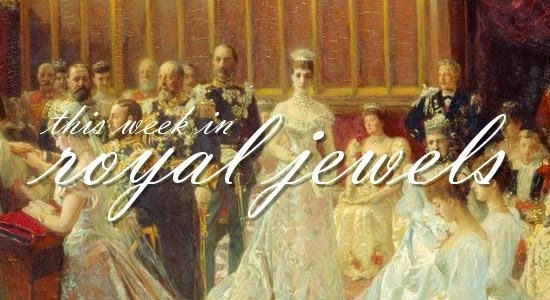 With royals from around the world descending on North America this week, we've got plenty of royal jewelry to discuss. Enjoy! 10. On Monday, American-born Queen Noor of Jordan attended the UN Equator Prize Gala at Lincoln Center, wearing turquoise earrings, a geometric necklace, and a pair of gorgeous bracelets. 9. The Danish crown princely couple finished their visit to Canada on Friday with a visit to the Hudson's Bay in Toronto, where Crown Princess Mary wore delicate earrings, a coordinating bracelet, and bejeweled rings, including her engagement and wedding set. 8. On Sunday, the Swedish court released a new portrait of Crown Princess Victoria, linked with her work in support of Cancerfonden. In the photo, she wears large earrings and a ribbon supporting the cause. 7. Princess Charlene of Monaco wore understated pearl stud earrings to the meeting of the Clinton Global Initiative in New York on Monday. 6. In Antwerp on Wednesday, Queen Mathilde of the Belgians paired a pair of large modern gold earrings with her floral dress. 5. While visiting a school in New York on Wednesday, Queen Letizia of Spain eschewed her usual small stud earrings for a pair of elegant pendant drops. 4. Catching up with an event held last week, Queen Rania of Jordan wore delicate jewelry, including a set of thin bangles, while attending a dinner with her husband and President Hollande in Paris. 3. A pair of earrings, bangle bracelets, and a small brooch were the choice accessories for Queen Maxima of the Netherlands as she met with UN Secretary General Ban Ki-moon on Tuesday. 2. Crown Princess Victoria's earrings and outfit both glittered in Stockholm on Monday at an event for the Pontus Schultz Foundation. 1. A service honoring those who fought in the Battle of Britain brought the Prince of Wales and Duchess of Cornwall to Westminster Abbey on Sunday. The Duchess wore pearl and diamond earrings, a pair of diamond RAF wings on the lapel of her jacket; she also wore a three-stranded pearl necklace with a distinctive sapphire and diamond clasp -- possibly a new addition to Camilla's collection? You can now find The Court Jeweller at thecourtjeweller.com! Old links should forward seamlessly. You can also now find me on Twitter at @courtjeweller and e-mail me at ella@thecourtjeweller.com!